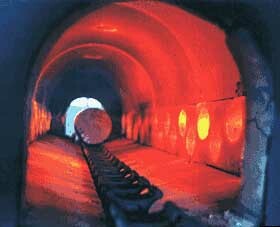 Preheating of aluminum billets in support of extrusion or other hot forming operations. Forging is the process of forming aluminum by impacting and/or squeezing a preheated aluminum blank between two halves of a die. A succession of dies may be needed to achieve the final shape. Forging provides advantages over casting in that internal microstructure can be oriented to improve strength, and internal defects or porosity are minimized. The aluminum blank is typically heated to 600°F – 900°F, but some cold forging (Cold forging is performed on billets at room temperature. This process involves high die costs and is typically limited to high production volumes.) is also performed in the industry.